Whether you have found out that you are pregnant or have heard the news that you are adopting a baby, congratulations! For people who are ready to take on the joy and challenge of parenthood, this time can be full of excitement. Expecting mothers who aren’t ready to have a child may face uncertainty and fear as to what the future beholds. As your trusted adoption center, A is 4 Adoption is here to help birth mothers and adoptive parents alike. Unlike any adoption agency in California, our private adoption company works to deliver personalized results that ensure the best outcome for everyone involved. We understand that putting your child up for adoption is a hard choice to make, and our support services ensure that birth mothers get the help they deserve for making such a brave decision. For many prospective parents, preparing for the baby begins as soon as you are ready to start the adoption process. Even if you feel you are prepared, it’s important to check in to see if anything is missing. Today, we’ll highlight a quick list to help first-time parents prepare. A is 4 Adoption is here to provide professional services for fast and effective outcomes through every stage of this process. Call us today or fill out our free form to learn more! There are many products that will be needed once your new bundle of joy arrives home. Our private adoption services center on newborns, which is why our list will start at birth for recommendations. Remember that our adoption center is here to help, and we do have children in need of loving homes! An appropriate crib. There are many styles and price points to choose from, making it beneficial for you to be proactive in finding good deals. Be sure that the crib is suitable for your home and matches the age requirements of your new baby! Crib mattress. Infants can rest easy on soft, supportive mattresses that promote hypoallergenic positives and infant safety. Mattress covers. Keep in mind that your new baby will be messy, making it beneficial to invest in a couple of waterproof covers.This will reduce the burden on you when keeping the crib clean. Fitted sheets. Be sure to find a soft, safe set of sheets to go over your mattress cover. Lightweight blankets. It will be important to keep your infant warm through the colder months, as babies are not as able to maintain their body temperature. The material of your blanket may depend on the season! Changing table. While you do not need to invest in furniture designed for changing your infant, it is highly recommended for safety and sanitary measures. A changing pad can also be used. Diapers. One of the hardest components of preparing for parenthood is understanding what diapers to purchase and how much. You may be surprised to see how many your little one can go through in one day! Diaper wipes. Changing your little one regularly will help to ensure good health and hygiene. Be sure to stock up on wipes designed for infant use. Dresser. Babies grow, and fast. What this means for you: use a large inventory of adorable clothes for your little one to thrive in. Be sure you have the space and drawers for storing baby clothes in a neat, orderly manner. Baby powder and ointments. It will fall on you as the new parent to ensure that your little one is happy and healthy. Be sure to purchase baby powder, as well as diaper rash ointment, to provide the most comfort for the baby. 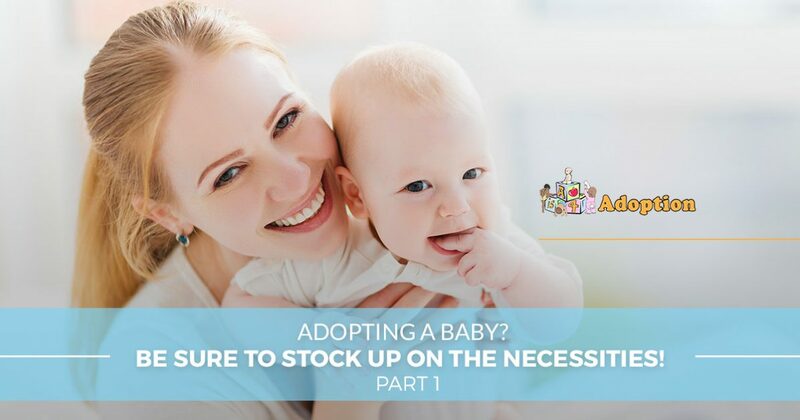 Regardless of whether you are giving birth or are adopting a baby, it will be vital for you to collect all of the essentials needed to care for your infant. This is an entirely new life, after all! Next time, we’ll continue this topic by highlighting the major needs in your bathroom for bathing as well as the kitchen for meals. If you’re here looking for an adoption agency in California, turn instead to A is 4 Adoption for assistance. Our private adoption center specializes in cutting through the red tape to provide amazing results for everyone involved.